May I Make Three Wishes? This is a fun reading and writing activity to practice the key phrases of the grade 5 lesson, May I Take a Picture? I have used this for my past reading classes but it fits really well with this lesson, too. The kids got creative with their wishes and I expect to mark and create a display for the classroom for these projects. I hope this can help with your classes! Download PPT here for free. Download Worksheet here for free. First we did some reading about Aladdin using the PPT , some pages link to youtube videos, added fun. Next, we went over the possible wishes to ask - using the key vocabulary and more. 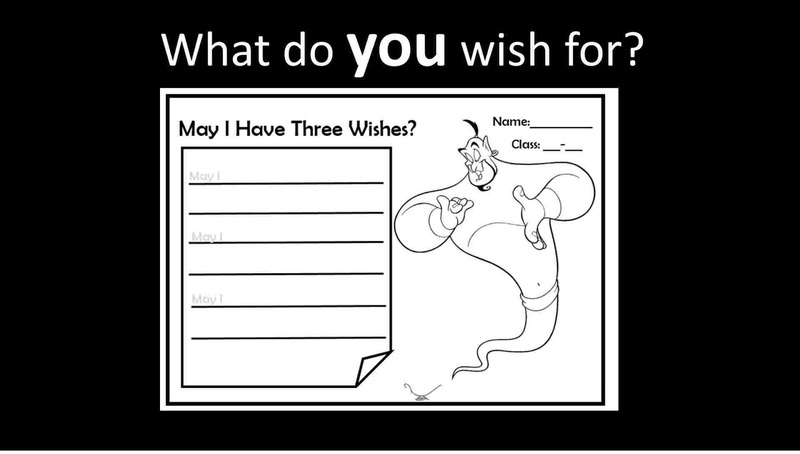 Next, it ends with the worksheet which you print and give to each student to come up with their own 3 "may I" wishes/questions. I suggest you do a 5 point marking system. Tell them they get 1 point for each sentence completed, (3/5). They get 1 point for writing their name and class correctly (4/5). And finally, 1 point for coloring and making it presentable, nice handwriting, etc (5/5). I explained this 5 point system and said "Next class, when you give your worksheet to me I will give you 1 candy if you get 5 points." I always believe a marking system that you show your students is effective in getting them to finish work successfully as well as understand why they deserve or don't deserve a reward. I'll post some of my student's work once they hand them in. Happy Teaching! Who's Behind The Card? Draw and Guess Game!